We keep hearing about how Android is blowing out its competition. It is true that the Android platform has grown a lot in the past couple of years. But as the Nielsen suggests, iOS has been able to close the gap in sales at the end of last year. 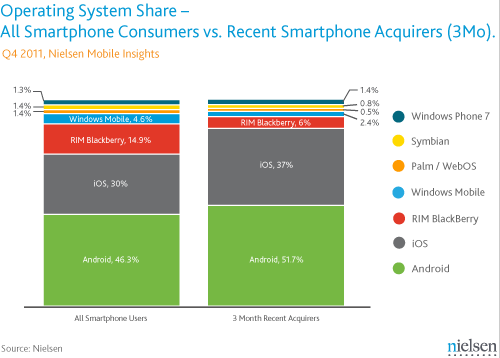 iOS’ share reached 44.5% (among recent acquirers) in December which is not far behind Android’s share at 46.9%. Many Apple fans expected the company to release the iPhone 5 last year. But the iPhone 4S has been good enough to give Apple a lot of momentum. The research shows that 57% of new iPhone owners surveyed picked up an iPhone 4S. 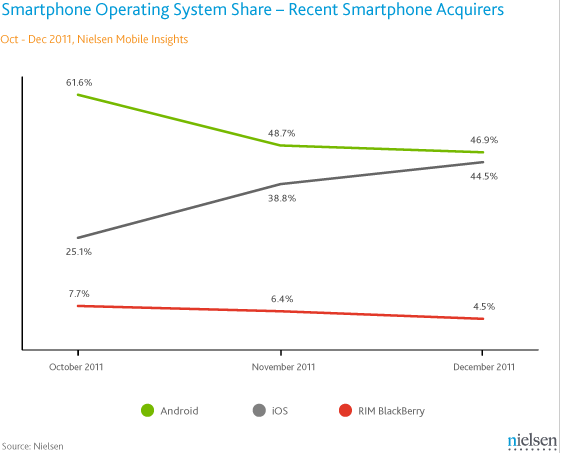 Android does continue to hold a healthy lead in the mobile OS business. Considering all the Android devices available on the market, that is not really a surprise. It will be interesting to see how the next generation Apple devices fare against Android Ice Cream Sandwich smartphones and tablets. But this is really a 2-horse race at this point, with BlackBerry, Windows, and Symbian not being able to keep up. New iPods Coming, Apple To Introduce a Pandora-like Service?